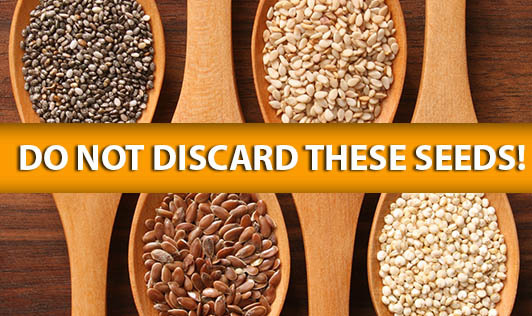 Do Not Discard These Seeds! Most of us have the habit of discarding seeds. But the fact is seeds are healthy and rich in antioxidants. Eating them can be a good health practice and a good pass time activity as well! Pumpkin seeds: These seeds have properties to reduce inflammation and treat depression without any side effects. It tastes delicious when roasted with salt and pepper. Watermelon seeds: These seeds are often not eaten along with the fruit. You can separate them. Sun dried watermelon seeds are commonly sold and are very popular. It is rich in zinc, magnesium, iron, potassium, vitamins and good fats. To get maximum nutrition benefits, water melon seeds should be chewed. It is commonly used in mouth freshener mixtures. Deskinned water melon seeds can be used to garnish sweets and desserts. Cantaloupe /Muskmelon seeds: These seeds are no more the part of the fruit that needs to be discarded. These seeds have a good amount of protein, vitamins, calcium and fiber. Roasted cantaloupe seeds are used as a snack by the Chinese for centuries. Ground musk melon seeds can be used as a base for soups. Sesame Seeds: As these seeds are not used frequently in our daily foods, we can work on introducing it in our diets often. These are rich in copper, calcium, magnesium, vitamins and fiber. These seeds enhance the taste of salads and vegetables, and ensure you have a healthy meal. Eating only the flesh of the fruit and discarding the seeds means throwing away the goodness of health. So, the next time you eat these fruits, make sure you don't waste these seeds. They are healthy, edible and tasty.